Thomas Earl Petty was born in Gainesville, strummed his first guitar chord in Gainesville, wrote his first song in Gainesville. And more than any other figure in popular culture, it has been his abilities as a singer and songwriter that put Gainesville on the music map. The son of insurance salesman Earl Petty and tag office clerk Kitty Avery, Tom was drawn to rock 'n' roll at an early age. He was 10 years old when Elvis Presley came to nearby Ocala to make a movie. Standing behind the barricades on the outdoor set, Petty saw the teenage girls swoon and scream whenever Elvis emerged from his trailer. "He got home and he told us all about it," recalled Earl Petty. "He was so excited. And he wanted him a guitar." His first band, the Sundowners, was formed with buddies from Howard Bishop Middle School. They played the Beatles, the Byrds and the Animals, all the hit groups of the mid-'60s. The Sundowners became the Epics, and when Petty graduated from Gainesville High School in 1968, the group was called Mudcrutch. At a ramshackle house in northwest Gainesville, dubbed Mudcrutch Farm, the group held weekend-long music festivals. The neighbors complained about the noise, the open drug use and the wall-to-wall hippies. For a time, Mudcrutch was the house band at Dub's Steer Room, the rock 'n' rollingest club in town (just up the street from the "farm," which made things convenient for those nights the musicians had to stumble home under some influence or another). By 1974, Mudcrutch included Benmont Tench, also a Gainesville native, and Mike Campbell, a friend from Jacksonville. The band relocated to Los Angeles, and within a year, broke up and reorganized as Tom Petty & the Heartbreakers. Gainesville pals Ron Blair and Stan Lynch were recruited to play bass and drums, respectively. Producer Denny Cordell (Joe Cocker, Procol Harum) signed the band based almost entirely on Petty's songwriting. It took awhile, but the band's blend of hard rock with '60s guitar-pop caught on with an audience drained by disco and unimpressed by punk. Petty's first million-selling album, "Damn the Torpedoes," was released in 1980, and the band topped each success with a greater one throughout the decade. 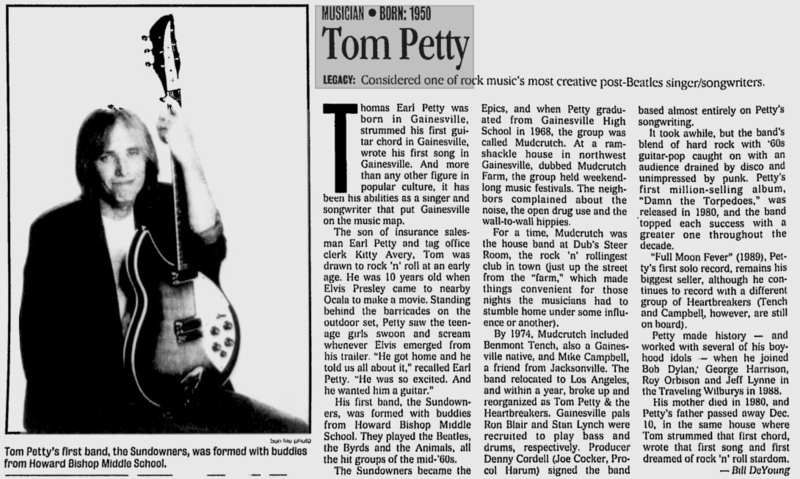 "Full Moon Fever" (1989), Petty's first solo record, remains his biggest seller, although he continues to record with a different group of Heartbreakers (Tench and Campbell, however, are still on board). Petty made history -- and worked with several of his boyhood idols -- when he joined Bob Dylan, George Harrison, Roy Orbison and Jeff Lynne in the Traveling Wilburys in 1988. His mother died in 1980, and Petty's father passed away Dec. 10, in the same house where Tom strummed that first chord, wrote that first song and first dreamed of rock 'n' roll stardom.